Formula One has waved goodbye to Europe and jumped back upon planes, trains and automobiles to wind their way back to Asia. Singapore plays host to the next round of the 2014 season, and that means its time for drivers to get ready for a long race, a hot evening of running, and most of all, to dig out their clear visors. It's moon o'clock in F1, as the lengthy Marina Bay street circuit is lit up under bright lights for the sport's only full night race. The Mercedes crew appear to have got themselves under control for now, with an amicable, if frosty, appearance in Italy. Rosberg still has control of the championship but Hamilton closed the gap with his Monza victory. Meanwhile, Felipe Massa got the better of his teammate and took his first podium for the Williams team, so he (and they) will be on a high as they head into this weekend. Struggling teams include Caterham, who are announcing Kamui Kobayashi's presence on a race by race basis, and Lotus, who have history at the Singapore circuit, and have had ongoing reliability troubles pretty much since the season began. Look for those cars that are more durable to do well, whilst those looking a little shaky to suffer in the harsh conditions of this endurance event. Support racing for this event includes Porsche Carrera Cup Asia and Masters Historic Racing. At first glance, it looks like I've made an error and copied the same weather graphic two times too many. But no, this is what the long range forecasts suggest Singapore will be like - warm, humid, and very, very consistent. Highs tip over the 32 degree mark, whilst humidity hovers at 60%. So far, in the history of the racing at Singapore, we have yet to see a wet night race. Might that change this year? The track is unusually wide for a street circuit, but there are too many turns and not enough straights to make good racing a possibility. The barriers are close, presenting the challenge of concentration just like at Monaco, and the heat can also present another variable for drivers to take into account. 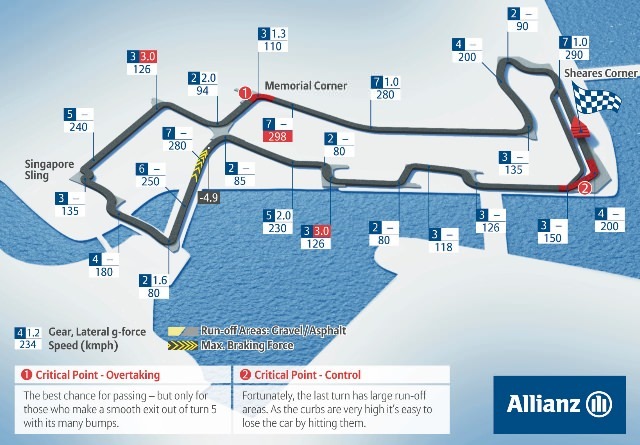 The race is run in an anti-clockwise direction, and the lap begins with a tricky complex of corners that gradually widen up and lead to a faster section. The next part of the track includes areas named by competition-winning fans, and the tarmac gets very bumpy. In the shadows of the night, sparks can fly and make for some excellent photo opportunities. With such a twisting and long track, the only way to keep the pack together is using the safety car, which does often make an appearance around the Marina Bay circuit. The race always tends to venture near the two hour maximum time limit, with the shortest event being the 2009 race - won by Lewis Hamilton in 1 hour and 56 minutes. Every single race since the first in 2008 has had an appearance from the safety car. Last year it was Daniel Ricciardo crashing into the barrier that brought out the FIA vehicle. The confines of the track can make it difficult for the marshals to recover cars quickly and efficiently, so expect teams to factor a safety car period into their strategies. The race also brings up a unique challenge for the drivers, being at their best in the evening rather at midday. Most will fly in to Singapore relatively early to get accustomed to the climate, but stay on European time. That means breakfast at 3pm, being at the peak of racing fitness in the evening, with bedtime in the early hours. Blackout blinds are often used to sleep late, but you'll still see plenty of tired faces across the course of the weekend. 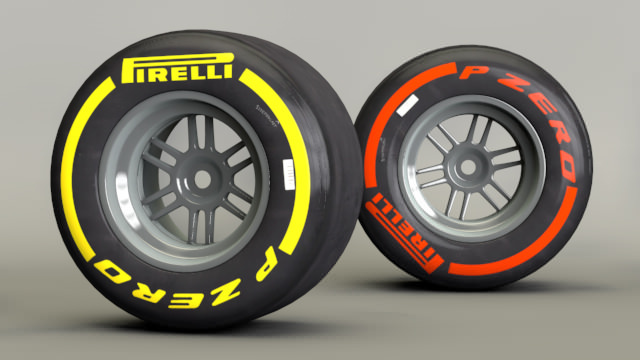 Pirelli have opted to bring the traditional street circuit selection of soft and supersoft compounds to Singapore, which is different to their normal choice. It may add another element to the weekend, particularly as the track is heavy on braking (expect lockups) and bumping in many places. The Italian tyre supplier particularly point to the left rear as one to watch, because it has to deal with high "longitudinal and sideways accelerations." This is actually a step softer than last year, when we nominated the medium and supersoft, so we should see some interesting tyre strategies with teams taking full advantage of the performance on offer. There’s traditionally quite a high incidence of safety cars, so every strategy has to be flexible enough to bear this eventuality in mind as well. Alan Jones 1980 Formula One World Champion, former Australian Touring Car and V8 Supercars racer, as well as Australian F1 commentator.